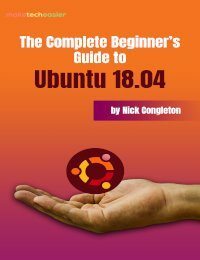 When I first began using Linux, I was fortunate that I had a few friends around who knew it well, and were able to answer my questions and provide support. Not everyone is so lucky. Fortunately, these days there are a multitude of ways you can get the info you need without calling up Cousin Ron the Computer Wiz. He’s probably busy recompiling his kernel anyway. 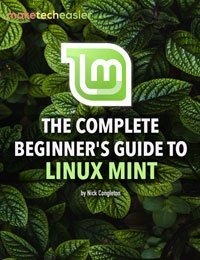 Many of the things I’ve listed here are well known to long time Linux users, I’m hoping that those who are just starting out, or are considering the switch, can find a few useful resources for making your system work the way you want. Linux is meant to be tinkered with, there are examples and how-tos everywhere. With the extensive guides and forums available to everyone, you don’t often encounter a problem that hasn’t been seen and blogged about by now. There are also quite a few things already built into a Linux OS that are there to help you get the information you need. 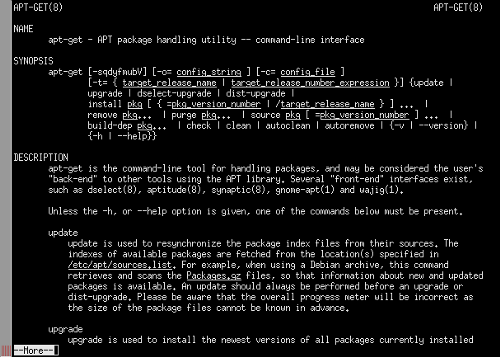 Here’s an example of the man page for apt-get. 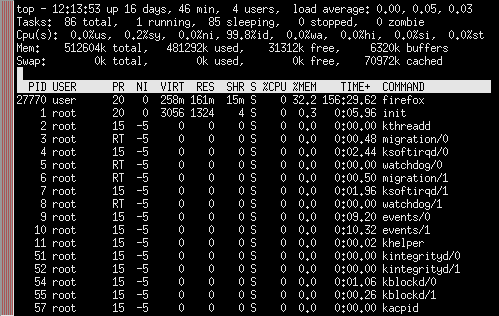 top is a tool that shows you what processes are using the most CPU time, along with some other resource usage information. If something seems to be slow or locked up, top is one thing you can use to find out what’s going on. It typically updates every three seconds so it can be a good way to monitor your resource usage for a while. It’s along the same lines as the Processes tab of the Windows Task Manager. Here, for example, I can see that Firefox is using up far more of my RAM than anything else running on my system, but it’s not currently stressing my CPU at all. and look for directories called FAQ and HOWTO. If you don’t see them, then you don’t yet have the documentation installed. Not to worry, it’s a quick package fetch away. In Debian/Ubuntu style distributions, you can use apt-get or aptitude to install the package doc-linux-html (if you want your documents in HTML format) or doc-linux-text (if you prefer plain text files). 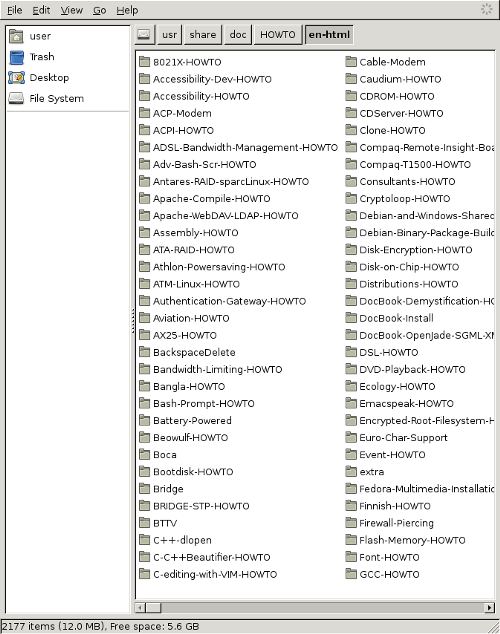 The HOWTO directory contains a HUGE amount of information on everything from printer setup to kernel hacking to setting up a Beowulf cluster. 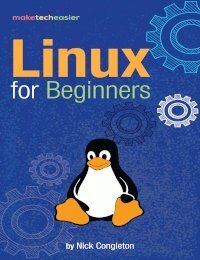 There are places all across the internet dedicated to helping new Linux users, or even advanced users who are having trouble getting things to work just the way they want. When all of the above fails, there are always web forums and communities with lots of people willing to help out. When posting to a forum or community, you’ll get a MUCH better answer if you ask a better question. Here are a few tips for how to ask for help in a way that will get you the fastest, most useful response. RTFM. Even the nicest, most well meaning forum member will get irritated if you ask a question that can be answered with a simple web search or a check of the program’s man page. Check available documentation and Google Linux Search before posting to a forum. Chances are, you’re not the first one with this problem. Include software/hardware details. This relates to the item above. If your mouse is acting funny, include things like which version of X you’re running, what window manager, when did it start acting up, etc. The more detail you include, the fewer questions they have to ask you before solving your problem. Be specific on the problem. Are you getting error messages? If so, what do they say? When do they come up? Finally, use decent spelling and grammar. It really helps. Some of this may seem like common sense, some of it may seem obvious, but every day I talk to people with questions that could be answered quickly and easily if they knew where to look. We’ve all heard the saying about teaching a man to fish, well if you’ll forgive the bad pun, this is about teaching a fish to use man. Get it? Yeah, I know, I should be a comedian. You forgot to mention IRC. Most distros have support channels on freenode or OFTC. It was a deliberate choice to leave out IRC actually. While there are a lot of great channels out there with friendly, helpful people, there are also a lot of people who just bash new users and try to make them feel inferior. Of course that’s true of places like the forums I’ve listed, but it’s been my experience that IRC tends to be a breeding ground for trolls more often than you’ll find at other help sources. Maybe it’s just bias from my own bad experiences in IRC. Thanks for the comment Marijn! Yea, you hit it right on the nose. I don’t normally use the Google Linux search unless the normal Google doesn’t yield any results. Also, check out local libraries or Linux, Unix and BSD books. While out dated, they can sometimes be helpful. We try to support any distro, and we work really hard to keep it spam free. where blah is some word likely to appear in the description of the command. I have to second the IRC comment. I haven’t come across that many trolls on the default (your distro here) channels. Most have been very helpful if not better than the forums I frequent. I couldn’t live w/o them to be honest. Great article though. Probably the nicest way I’ve seen someone say RTFM.